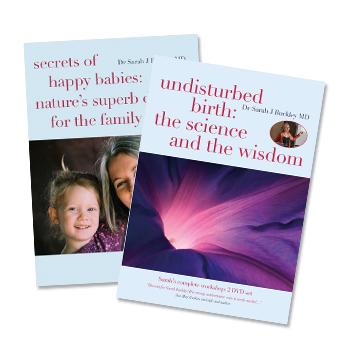 Deluxe DVD Set: Undisturbed Birth plus Secrets of Happy Babies. Sarah’s Complete Lectures on DVD Free shipping worldwide! How does the superb design of our female bodies enhance safety, ease and pleasure in labour and birth? How can we enhance Mother Nature’s superb design to benefit mothers, babies, fathers and families? What effects might maternity care interventions have on this superb design? 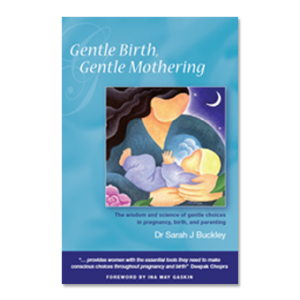 Discover the science and wisdom of gentle, natural birth in this 2-DVD set exploring the “Ecstatic Hormones of Undisturbed Birth” and their crucial role in birth, breastfeeding and bonding. Discover oxytocin, the hormone of love, calm and connection; beta-endorphins, hormones of pleasure and transcendence, and the body’s natural pain-killers; adrenaline and noradrenaline (epinephrine and norepinephrine), the excitement hormones, which also optimize the baby’s transition to life outside the womb; and prolactin, hormone of tender mothering — and tender fathering too. Learn how common interventions such as induction with synthetic oxytocin, epidural pain relief, and caesarean surgery can interfere with these delicate hormonal processes, with potential negative effects for mother and baby. 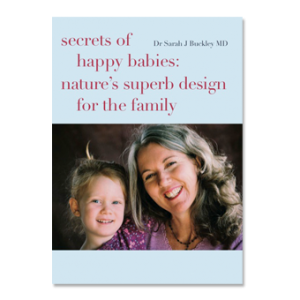 Discover how Mother Nature’s superb design continues during the hour after birth, and how we can optimise these enormous transitions for mother and baby. Sarah also discusses the ideal timing for cord clamping and the hazards of cord blood banking. This DVD set is ideal for midwives, doulas, childbirth educators, obstetricians, and any professionals working with pregnant and birthing families. Expectant mothers and fathers will also gain a deeper understanding of, and trust in, the natural processes of labour and birth, and learn how their babies can also benefit enormously and life-long from Mother Nature’s superb design. What parenting practices will lay a strong foundation for a lifetime of happiness? Sarah answers these and more in this frank, fascinating and practical 1 1/2 hour talk, recoded live in London. What steps can we take, even before conception, to lay the foundations of ease and pleasure in parenting? How will Mother Nature’s superb design help us to care for our babies and simplify issues such as sleeping and feeding? Is it safe to sleep with your baby? This talk is ideal for parents and parents-to-be as well as midwives, doulas, childbirth educators, and all professionals involved in the care of mothers, babies, fathers and families.